If you've been shying away from eating nuts because of their high fat content, there's good news. Scientific evidence suggests that 1.5 ounces a day of nuts like almonds and walnuts, as part of a diet low in saturated fat and cholesterol, may decrease your risk of heart disease, according to the United States Food and Drug Administration. Adding a few nutrient-rich almonds and walnuts to your daily diet is a tasty way to give your body a healthful boost. A 1-ounce serving of unsalted almonds -- 20 to 24 nuts -- has 163 calories and contains 6 grams of protein, which is approximately 12 percent of the daily value set by the FDA. The same size serving provides 3.5 grams of dietary fiber, which is approximately 14 percent of the DV, as well as 6.1 grams of carbohydrate and 14 grams of total fat, which includes 1.1 grams of saturated fat. 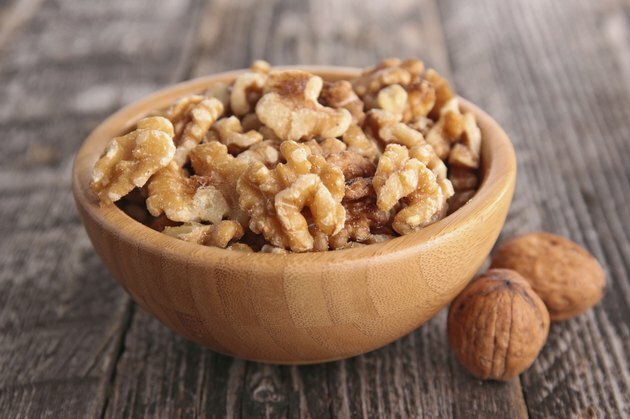 Eating a 1-ounce serving of unsalted walnuts -- 8 to 11 halves -- provides you with 185 calories, 4.3 grams of protein, 3.9 grams of carbohydrate, 1.9 grams of dietary fiber and 18.5 grams of total fat, including 1.7 grams of saturated fat. Almonds and walnuts are both high in vitamin E, although almonds are slightly higher at 7.7 milligrams, which is approximately 27 percent of the daily value set by the FDA, compared to walnuts at 6.7 milligrams of vitamin E per 1-ounce serving. On the other hand, while almonds have no B vitamins, walnuts contain a trace amount of vitamin B-6. Vitamin E acts as a powerful antioxidant in your body, protecting cells from damage by unstable molecules known as free radicals. Vitamin E also protects vitamin A and certain lipids from damage. Although both nuts contain calcium, magnesium and potassium, almonds edge out walnuts in all three categories. Almonds contain 75 milligrams of calcium per 1-ounce serving compared to the 28 grams in walnuts. They also contain 200 milligrams of potassium per 1-ounce serving compared to the 125 milligrams in walnuts, as well as 76 milligrams of magnesium compared to the 45 milligrams in walnuts. Calcium helps build and protect strong bones and teeth, while potassium helps balance body fluids and maintains a steady heartbeat, and magnesium is essential for many chemical reactions in your body. Almonds and walnuts each make valuable contributions to a healthy diet. In addition to their nutrient-rich contribution, a study published in "Nutrition & Metabolism" in January 2011 found that eating almonds along with a high glycemic index food lowers the GI of the entire meal and reduces the rise in blood sugar after eating. And walnuts, according to University of Michigan Health Center, are the only nuts that contain a large amount plant-based omega-3 fatty acid. A mere 1-ounce serving provides more than 100 percent of the recommended intake of these nutrients for both women and men.